MOSCOW (Sputnik) - Ukraine's Security Service (SBU) on Tuesday held a series of searches in Kiev in the offices used by the RIA Novosti Ukraine news agency as well as in apartments of the employees working for the media outlet, and detained the head of RIA Novosti Ukraine news portal. 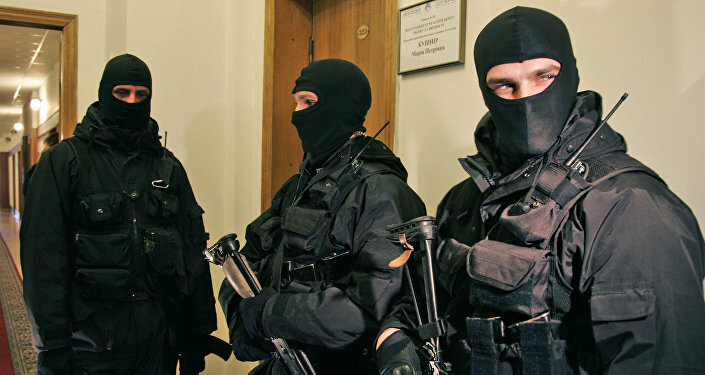 The SBU officers raided the office of RIA Novosti in Kiev. A journalist, who was in the office at the moment, was not able to contact the editorial staff for quite a long time and succeeded to do it only after being questioned by the officers. At the same time the searches took place in four other sites linked to RIA Novosti Ukraine, particularly in an apartment of Ludmila Lysenko, a Ukraine-based correspondent of the RIA Novosti news agency. "In the morning, around 9 a.m. [06:00 GMT], the SBU officers came [to my place]. They have conducted a search… Additionally I was ordered to come to the SBU questioning next Friday," Lysenko said, adding that she had been prohibited to disclose other details of the incident. During the SBU operation Kirill Vyshinsky, the head of the RIA Novosti Ukraine web portal, was detained. "At the moment, the violation of law is preliminary classified as the Part 1 of the Article 111 [of the Criminal Code of Ukraine], it is treason," Ihor Ponochovny, an official from the Ukrainian prosecutor’s office for Crimea, said at a briefing. According to the SBU, Vyshinsky has a dual citizenship, and the Ukrainian authorities will consider the issue of stripping him of the Ukrainian passport. "We thought that he was a citizen of Ukraine. But a Russian passport was found during searches, in other words, this individual has a dual citizenship. Apart from legal proceedings, the issue of stripping him of Ukrainian citizenship will be addressed," SBU Deputy Head Viktor Kononenko said at a briefing. Kononenko added that the security service suspected Vyshinsky of supporting the self-proclaimed people's republics of Donetsk and Lugansk. According to the security service, Vyshinsky has allegedly been receiving 53,000 euros ($62,800) on a monthly basis from Russia. Another journalist, Andrey Borodin, the head of the Ukraine-based office of RIA Novosti, said that searches at his home lasted for 11 hours on Tuesday. The recent developments in the Ukrainian capital have been widely criticized by Moscow. Russian Foreign Ministry spokeswoman Maria Zakharova said that the steps taken by Kiev in regards to the RIA Novosti Ukraine were a set of arbitrary acts. In a statement published on the website of the ministry the spokeswoman said that Kiev had intensified "repressive activities in the information space, ranging from attacks on and deportation of Russian and foreign journalists from Ukraine to provocations against Russian diplomats on international media platforms." According to Zakharova, in recent weeks Ukraine has taken a number of steps targeting Russian reporters working in the country citing recent deportations and publication of private information of the reporters "on the notorious online resource Mirotvorets." Zakharova criticized the situation, when the Western states and international organizations did not pay enough attention to these developments. "We believe that this forbearance directly threatens the future of the common European space because it is promoting the suppression of dissent in the worst totalitarian traditions. We will continue to demand an appropriate assessment of such developments by the concerned international agencies," the diplomat said. The Russian embassy in Ukraine sent a note of protest to the Ukrainian Foreign Ministry demanding to end abuse of reporters and called on Kiev to refrain from new steps that would escalate the tensions between the two states. Leonid Slutsky, the chairman of Russia's lower house's Committee on International Affairs, expressed confidence that the Russian delegation at the Parliamentary Assembly of the Organization for Security and Co-operation in Europe (PA OSCE) would call for the condemnation of RIA Novosti Ukraine journalist's detention at the assembly's summer session. "I completely agree with the fact that the international community should finally provide an adequate reaction to the long-standing policy of oppressing Russian-language media in Ukraine. We, for our part, will continue to raise the issue at all the international parliamentary organizations. I am sure that during the summer session of the OSCE Parliamentary Assembly the Russian delegation will call for condemnation of journalists' detention," Slutsky told reporters. The lawmaker said the recent steps taken by Kiev had violated international law. Rossiya Segodnya Director General Dmitry Kiselev has demanded that the Ukrainian authorities free Vyshinsky immediately and end their persecution of the media. Margarita Simonyan, the editor-in-chief of Rossiya Segodnya news agency and RT broadcaster, has stated that she thought what was happening in Ukraine was Kiev’s "revenge" for the recently opened Crimea Bridge. She further noted that RIA Novosti Ukraine was not legally linked to Rossiya Segodnya, but was its media partner. The majority of Western states and international organizations have not responded to the developments in Kiev, however several remarks have been made. The German Foreign Ministry said Berlin was interested in receiving more information on detention of Vyshinsky. "I think that we stressed many times the principal importance of freedom of speech, and I think that both our embassy and the foreign ministry are interested in obtaining information on this incident to know what happened," Maria Adebahr, the spokeswoman of the ministry, said at a briefing answering a question of Sputnik. The diplomat added that support of the media freedom across the world was very important for Germany. "We are monitoring these reports closely and will be seeking assurances that these allegations are not politically motivated nor an attempt to interfere with journalists’ independence in Ukraine," Sagaga said. OSCE Representative on Freedom of the Media Harlem Desir raised concern over the SBU raids. "I express serious concern about this morning’s raid on Russian media offices in Kyiv, the arrest of journalists, and the search of journalists’ homes. I reiterate my call on the authorities to refrain from imposing unnecessary limitations on the work of foreign journalists, which affects the free flow of information and freedom of the media," Desir said in the statement published on the OSCE website. The OSCE official added that within the framework of the Helsinki Final Act, the OSCE member states had committed to ensure proper working conditions for foreign reporters working on the territories of such countries.